Drew Bevelhimer kicks a field goal during the 2016 season. Bevelhimer was one of twenty-two collegiate football players selected for the Allstate and American Football Coaches Association Good Works team. Collegian file photo. Upwards of 50,000 athletes play football at the collegiate level every year. Twenty-two of these athletes were named to the Allstate and American Football Coaches Association Good Works team on Sept. 13. Among this group is Butler junior kicker Drew Bevelhimer. 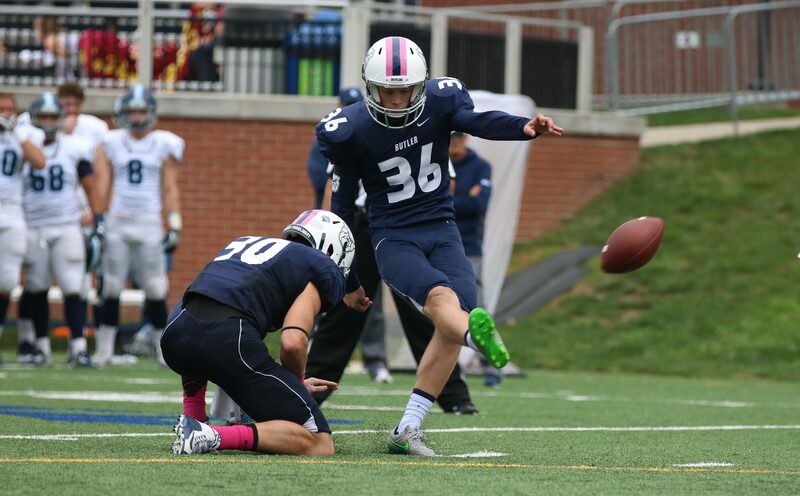 While Bevelhimer may be an all-Pioneer Football League kicker, his on-field contributions are not the reason he made this team. The Good Works team, presented by Allstate and the American Football Coaches Association, recognizes players that have made significant contributions to their communities. “The Allstate AFCA Good Works team has honored the college football players whose charitable involvement and community service contributions stand out among the more than 50,000 student athletes participating in the sport,” Allstate said in a press release. Bevelhimer said that he cannot take sole credit for the award. One endeavor the team is involved in is Team Impact Organization. Through their partnership with the organization, the team signed eight-year-old Robert Shaffer as an honorary teammate. Shaffer was diagnosed with an incurable kidney condition. He attends the team’s football practices and games and has his own locker in the team’s facilities. Bevelhimer said he gets as much out of the relationship as Shaffer. Berkley Cohn, an assistant account executive for Taylor Strategy representing Allstate, said Bevelhimer’s relationship with Shaffer was a factor in honoring the kicker. The impact Bevelhimer and the team have on Shaffer and other children with disabilities was apparent on Sept. 19, during a surprise presentation of the trophy for Bevelhimer. Before entering the field, Ean VanGordon, another child involved with the Butler football team, offered to help. VanGordon was born with numerous ailments that make it impossible for him to walk. “I want to give him the trophy,” VanGordon said to local Allstate agent Darrell Frye, who was prepared to do the honor himself. Frye obliged, and VanGordon handed Bevelhimer the award in front of the team. Bevelhimer is also a key part of Butler’s youth clinic, which the football team runs every year for children with disabilities. Over the summer, he and nine other teammates spent time in the Czech Republic, Austria and Poland, teaching everything from English to football to physical education classes. Bevelhimer said the charitable involvement he’s been a part of has taught him in a way that can’t be replicated. The Allstate AFCA Good Works team will be taken to the 2019 Sugar Bowl, which will be played in New Orleans in January. Approximately 49,750 college football players will not be in attendance. But Drew Bevelhimer won’t be one of them.